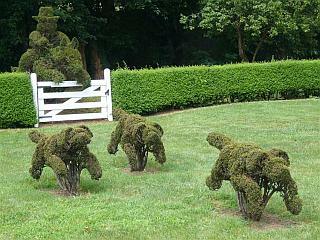 The following pictures I took of the "Hunt Scene Topiary." The fox hunters, horses, fox and hounds were so beautifully done. You certainly get the feeling of movement and excitement. If you close your eyes and let your thoughts wander, you can hear the call of the hunting horn and feel the vibrations of the horses as they race by. 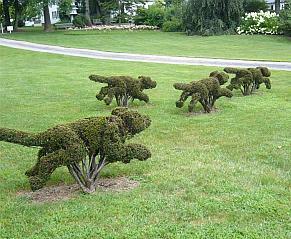 The life sized Hunt Scene of topiary horses, riders, hounds and fox is one of the most famous of Ladew's creations. 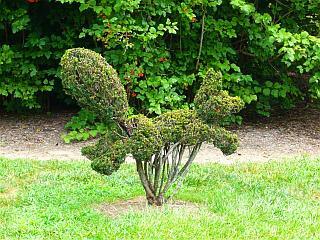 The description and information below has been taken from a Ladew Topiary Gardens Brochure. There was no copyright statement nor was there anything saying it could not be reproduced. I have changed a few words, but for the most part, it is a direct quote. 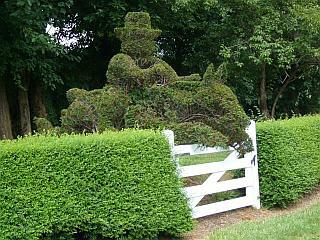 Ladew Topiary Gardens has been called "The Most Outstanding Topiary Garden in America" by the Garden Club of America. It is an extraordinary topiary garden designed and developed by Harvey S. Ladew (1887-1976) and this garden is known throughout the world. It is 22 acres of delightful gardens including more than 100 larger-than-life topiary forms which serve as the backbone and centerpiece to a series of garden rooms with names such as the Sculpture Garden, White Garden, Yellow Garden, Garden of Eden, Sculpture Garden and Iris Garden. Equestrian and fox hunting memorabilia, fine art and English antiques fill the circa 1747 Manor House. Ladew's unique Oval Library appears in the book 100 Most Beautiful Rooms in America. 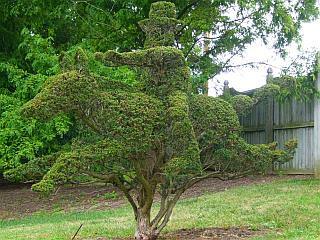 This is a lovely outing for anyone, but for my equestrian friends, it is spectacular find! Enjoy. In the summer months concerts are held at the Gardens in the evening for a small fee. It has a Wolf Trap feel. Bring your blankets, have a picnic and move to the sounds of the beat.